Q: Are there any quick ways to succeed in business? Q: Are there any quick ways to succeed in business without spending a huge amount of money on marketing? Unfortunately there’s no shortcut or magic recipe to success — or if there is, I haven’t found it yet. Creating a successful and profitable business takes time, since you build your reputation as customers learn to trust and rely on you, one by one. Also, there’s no guarantee that spending a huge amount of money on marketing will slingshot your business forward. If you spend your time looking for shortcuts, you will find one — right out of business. Above all else, you should not go into business purely for financial reasons. Running a company involves long hours and hard decisions; if you don’t have a better reason than money to keep going, your business will more than likely fail, as many new businesses do. So it’s important to create something of use that is going to benefit society as a whole. If you do something you truly care about, you will be in a much better position to find customers, connect with them, and keep them coming back. Once you have decided on the type of product or service that interests you, focus on how to do things differently from the competition: Do your research, find a gap or an area ripe for innovation, and position your business in a way that sets it apart. Customers don’t just shop for a brand and its products, but also identify with its core values. Ask yourself, why did I start my business? Be honest — this will help you establish an authentic value and voice. Then distill your message into something simple. 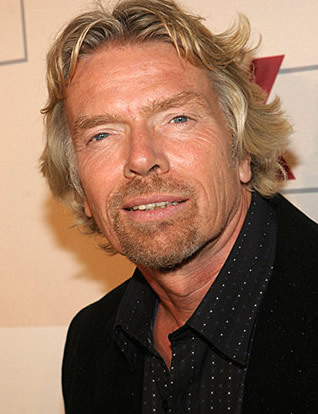 At Virgin, we stand for great customer service, good value and innovative alternatives to our competitors’ offerings. Most importantly, we view business as a force for good. Knowing who we are and what we stand for ensures that we don’t waste time or money on messaging that doesn’t represent us or resonate with our customers. I took his advice and I’ve been thinking up fun ways to stand out from the crowd and draw the media’s attention to our company ever since, from breaking world records to pulling pranks. While I’ve always been interested in sports and physical challenges, that might not be the route for you. Find your tone, know your brand, do things your own way, and create waves. The free advertising will follow. Tools like Twitter and Facebook are wonderful ways to get your message out to a wide audience. Social media is not only more cost-efficient than advertising, but it also offers great opportunities for innovative engagement with your customers. Use it to your advantage. Remember that there is a difference between selling and marketing. In my experience, selling a product through social media doesn’t work — it’s better to simply communicate with your customers in an authentic way and have fun. As you build an online profile that people can identify with and trust, you’ll find that they will soon become customers. The feedback you receive on social media can be invaluable, especially when your business is just starting out. Listen to your customers’ comments about your company’s offerings to gain an understanding of what you are doing right and wrong. You can also use this feedback to sharpen your social campaigns and measure the effectiveness of your calls to action. If you genuinely love and believe in what you do, others will take notice and share your enthusiasm. Geraldo, in your case, this might prompt people to take out a loan with your company instead of another provider, or encourage them to recommend your company to a friend. If you find your interest flagging, it’s time to make a change — switch from operations to management, move on, expand into new territories, anything that interests you. To find success, you need to be fully committed or your work will show it. Cole, thank you for following my Blog. I checked out your blog, it looks pretty interesting and we can definitely learn from each other. I followed back. I’d also like to keep in touch. Do you have an email?